This weekend, the 30th April, in Sweden is Valborgsmässoafton. Yes, another one of those long indecipherable Swedish words. This one translates as Walpurgis Eve, and is a day enshrined in tradition not only in Sweden but in other European countries such as Germany, Holland, the Czech Republic, Lithuania, Latvia, Estonia and Finland. Rather Baltic in other words. 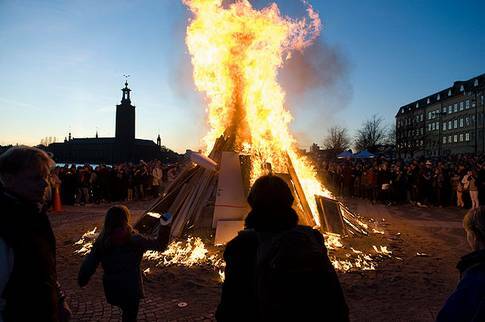 The name ‘Valborg’ is from an English Saint but, despite that, this isn’t really a religious celebration. It’s more to do with the welcoming of spring, and feels rather pagan actually. In the evening on Valborgsmässafton, Swedes gather around huge bonfires and listen to songs. These songs are in the form of traditional choir music designed especially for this occasion to shake off the nasty dark winter and celebrate the burgeoning buds of the lighter season. And like many traditions in Sweden, this one also has a rural origin. These bonfires are part of a Swedish tradition dating back to the early 18th century. On this day, farm animals were let out to graze and bonfires lit to scare away predators and other evil beings. This is rather ironic as Walpurgis Eve is also an important holiday in Satanism at it marks the founding of the Church of Satan. But religion aside. On Walpurgis eve, I am watching the Swedes watching the flames, listening to music and looking forward to the spring and summer months ahead. We survived another winter, and summer is coming! Is this widespread, or is it only a small number of Swedes who do this? It’s Nationwide. Also very popular time to get drunk as May 1st is a public holiday!